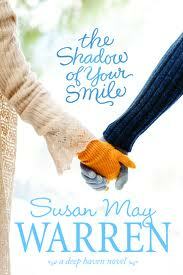 Susan May Warren’s book, The Shadow of Your Smile is another in the Deep Haven series. These books could be read out of order as characters from other novels are not of paramount importance and only provide more of the local color of the town in which the books are based. Noelle Hueston has been married to Eli for 25 years. The marriage fell apart after the tragic murder of their 17 year old daughter, Kelsy. Eli blames himself for Kelsy’s death, as well as that of a fellow officer who was killed that day. Kelsy’s friend Emma also carries a weight of guilt from that night too. This one death destroyed so many dreams and those left behind struggle in their faith. Noelle has an accident that results in amnesia and she loses 25 years of her life. Could this really be the man she married? Those are her two boys? Why did she give up her dreams of painting? And how did she get fat? Eli struggles to care for and protect his wife who he had drifted away from. He had begun an emotional affair with the fallen officer’s wife, Lee. Can he mend his broken marriage? Could the amnesia be a gift in that his wife is no longer trapped in her grief? Emma is struggling as a musician. She had been a partner of Kelsy’s in music and she feels like she lost her one chance to do anything good. Kelsie’s brother, Kyle, who she had always had a crush on, shows up and rescues her from a brawl. Passion ignites but can they overcome the spectre of Kelsy’s death and the damage it has done to their families? The killer who had inadvertently caused Noelle’s injury is still on the loose and doesn’t know that Noelle lost her memory. Will he strike again? Can her son, Kyle, now a deputy, solve the murder? Can Eli protector her if the murder strikes again? Can Noelle find a new life in spite of her amnesia and fall in love again with the man she married? Once again, Susan writes a complex tale filled with emotion and depth and the interconnectedness of the two romance plots. Well done!